I realize that in the realm of skincare issues, experiencing dryness on the one-square-millimeter area around my nose is hardly the most pressing to deal with—this coming from someone who has woken up on more than one occasion to find her entire body covered in psoriasis. But the fact that I'd choose the perpetually flaky skin around my nostrils over my autoimmune disease any day of the week doesn't make the former problem any less annoying. Slathering on my heaviest moisturizer isn't enough; covering the area with a thick layer of balm only alleviates the issue for a short while before it returns to its Sahara-like state. The skin around my nose is so thirsty, it renders even my most moisturizing concealer cakey in a matter of hours. What gives? My frustration with this seemingly unfixable problem hit its peak a few weeks ago while getting ready for a fancy dinner—an occasion that I knew would involve multiple photo ops. 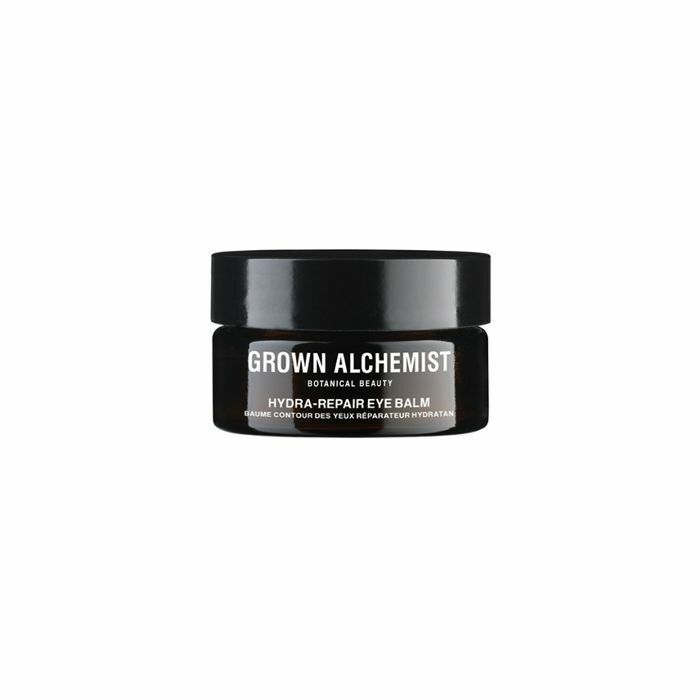 In a state of desperation, I searched my vanity for something, anything that might curtail the problem, when my eyes fell on my little jar of Grown Alchemist's Hydra-Repair Eye Balm ($99). I knew that this formula in particular utilizes different botanical extracts to effectively target the skin's moisture barrier and correct any abnormalities—and at the very least, it had proven itself immensely hydrating for my under-eye area. Fresh out of any alternatives, I figured it was worth a shot. Hours later, when I returned home, I peered in the mirror to find my concealer still looking fresh and dewy. Even after giving my face a good scrub, I touched the area around my nose and was shocked to find that it felt smooth and hydrated—a definite first. Had I stumbled upon the ultimate skincare hack? Before I got too comfortable with my perfectly moisturized nostril skin (if you have a cuter way of putting it, please send me an email), I decided to consult with celebrity esthetician and overall skincare guru Renée Rouleau to ensure that my new method wasn't sheer madness. For starters, I needed to know why (god, why) I was so prone to dryness in that area to begin with. She quickly confirmed the issue and my eye cream theory in one fell swoop: "More than likely, there is some disturbance in your moisture barrier, and it's causing the skin to be dry," she explained. Interestingly enough, when we apply skincare products, they're prone to pooling and seeping in the crevices of our nose—which can, in turn, cause our skin's natural hydration process to go haywire. "That," Rouleau said, "Or maybe it's from lack of exfoliation since you have to make a real conscious effort to work a facial scrub or Clarisonic in that area. So more than likely, you're getting too much of something or not enough of something." Tl;dr: The skin around our noses is deceptively finicky, which often manifests in dry, flaky skin. And that leads us to the next question: Why does eye cream work? In reality, it comes down to the formula you choose, says Rouleau. "Your eye cream probably uses much more of the reparative type of oils and emollients that are needed for drier skin under the eyes, so it's filling in the invisible cracks in the skin," she says, adding that once the skin seems consistently smooth, I can try giving my regular moisturizer a go again. The irony of all this is that I've only just started using eye cream for the first time in my life—only for it to promptly start dividing its time with my nose. But I've tried far weirder things in the name of beauty—and you can't put a price on baby-smooth nostrils, right? Shop more of our favorite eye creams below. On a related note, check out my go-to concealer hack.